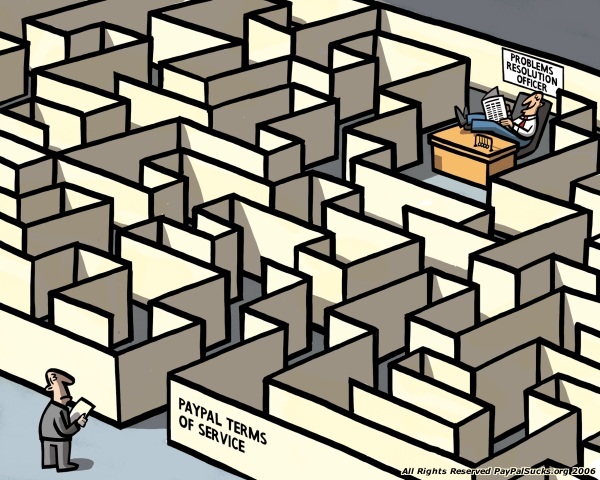 Over the years, both Ebay and Paypal have modified their terms of service and policies for buying and selling. If you have not read them lately, read them now, or read about them. You might be surprised at what you find. My experience, already chronicled in some detail, has driven me away from both of these companies. It s*cks to be a seller. Paypal is convenient, but checks are safe and sound for sales transactions. And who needs the fees? Not worth it, especially for sellers. Ebay is tougher. I've found alternatives, but for some items -- rare items or items for a specialized audience, for example -- Ebay is really the best selling option. Don't buy or sell for a dollar amount you can't afford to lose. If a questionable buyer buys your item, don't sell to them! You can refund their money with an explanation of your choice -- tell the truth, or you can make up a bogus reason not to sell (item broke, whoops! ), whatever. But you'll have to contact Ebay to refund their commission to you. One way to reduce the chance of getting a sale disputed is to offer a return policy. To me this is too risky for valuable items. Mail with tracking and signature required. Consignment shops. While I used to blanch at the commission, in retrospect it seems like a real bargain. Consignments shops get scammed, and they assume risk. The overhead for trial periods, shipping, answering questions, photographing, listing, is not trivial. Let THEM do the work, and be glad to give them a cut. Tacktrader.com -- I've sold things here. You get fewer nibbles, but eventually I've found a buyer for everything I've posted there. Facebook groups. Look for tack sales groups in your area -- there are 3-4 around where I live and they work! Craigslist. I admit I don't use Craigslist to sell, but many do. Anyone had luck with Craigslist? GMO/local horse group classifieds. I've sold many items via my local GMO's newsletter. Sick of Ebay? Try these alternative places to sell? Thanks for posting this. As a first time tack seller I am really nervous. I need the money from this sale to purchase another saddle, so the thought of losing it all to a buyer on Ebay scares me. I have listed it every where I can find online including Eventing Nation (it is a cross country saddle) and I am keeping my fingers crossed! Thanks again for the information! !